It's 50 years since Brian Wilson reinvented pop music with the Beach Boys’s kaleidoscopic Pet Sounds. In the intervening half-century Wilson has gained a reputation as one of rock ’n roll’s most notorious eccentrics (and occasional recluses) even as Pet Sounds has come to be regarded as among the greatest albums of all time. By way of honouring the anniversary, Wilson’s latest tour sees him reprising the record in its entirety. 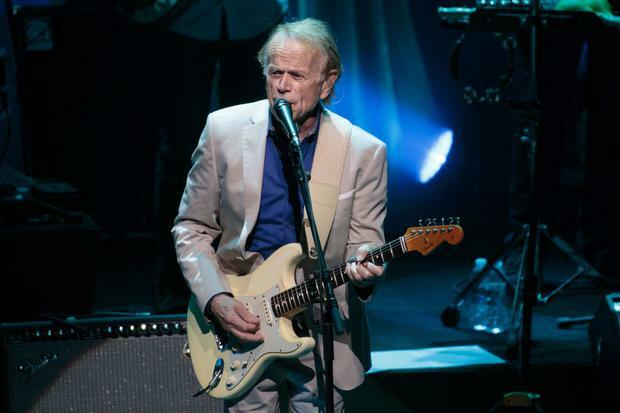 At a sold out BGE Theatre he sat unassumingly at a white piano and was flanked by Beach Boys’s rhythm guitarist Al Jardine. A stirring prelude saw the care-worn pair leading their ensemble through some of the Beach Boys’ best loved hits – starting with California Girls and concluding with the autumnal Sail On, Sailor. Then came the main course : Pet Sounds stirringly brought to life, with Wilson dewy eyed at his perch and Jardine's features crumpled with emotion. Fleshing out the melancholy and majesty of songs such as Wouldn’t It Be Nice and I Know There’s An Answer were ex-Rolling Stones touring guitarist Blondie Chaplin and Matt Jardine – Al’s son and the custodian of a falsetto almost as tingle-inducing as that of Wilson’s late brother Carl. It was lapped up by fans who understood they were basking in genuine genius. Pet Sounds has been hailed as rock's masterpiece so often its status has started to feel a little jaded. This concert was a thrilling reminder that it truly deserves its position on the pedestal.